The GOS supports SAP GUI Script recording, all we have to do is to disable in the SAP Logon the using of native Windows dialogs. More information here. To try it you can use the TAC SGOSTEST (Test tool for GOS). After that it is possible to record this activities also. Here an example with the transaction code FB03 with an export of a PDF file from the GOS. session.findById("wnd/usr/ctxtDY_FILENAME").text = "This is a test.pdf"
What script is needed for this window? 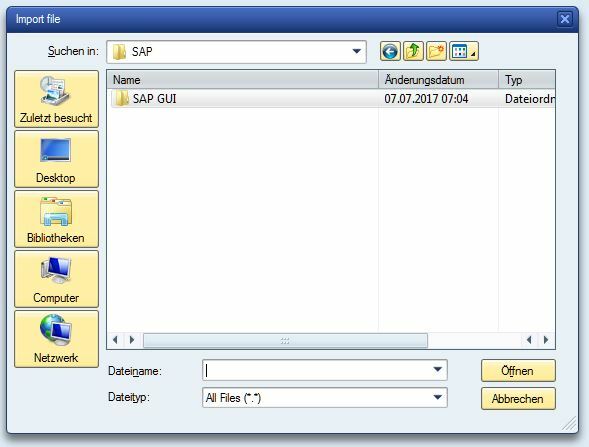 if you record your activities via SAP GUI Scripting, you see on the right side in the status bar a litte rotating barberpole. This means that a script is running. Do you activate the script recording if you see this dialog? If yes, which path resp. which activities do you use to open this dialog in Folders Management? The script is needed to load the pdf file from the disk, the actions of the file and the file are not displayed when the script is run. The form of loading does not change. When formatting and running the script stops Folders Management. Can I write a script for Folders Management? this is a modal dialog box, this means it blocks other applications, e.g. a running script, on the same process. It is necessary to start another independent process parallel to control this dialog box. You can find a solution here.